Sew Inspired: Giveaway Winner and UFO #4! I'll be back after I've triple checked the results. Robyn! I'll email you just as soon as I get this posted. Thanks so much to everyone for all the comments! Lots of people are very nostalgic for Rainbow Brite! And thanks to everyone who said nice things about my quilt top, too. I also wanted to share finished project #4. Sadly this sat for a week with about 7 inches of binding left to do. I finished it up this afternoon and washed and dried it. 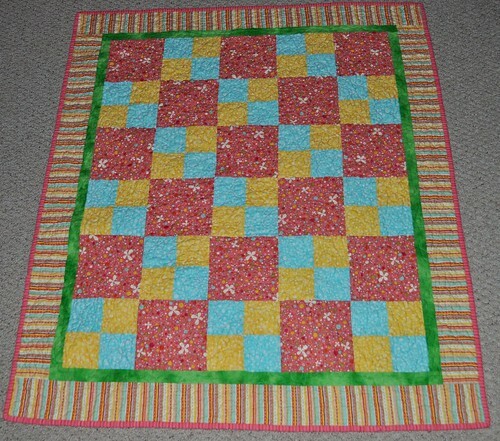 This is my Quilts For Kids quilt, finally finished and ready to go. If you don't already know about this, you can go to quiltsforkids.org, sign up, and they will send you a free kit to make a quilt. You have to provide your own batting and binding, then wash and dry the quilt after it's done and send it back. The quilts are given to children who have life threatening illnesses or are victims of abuse. 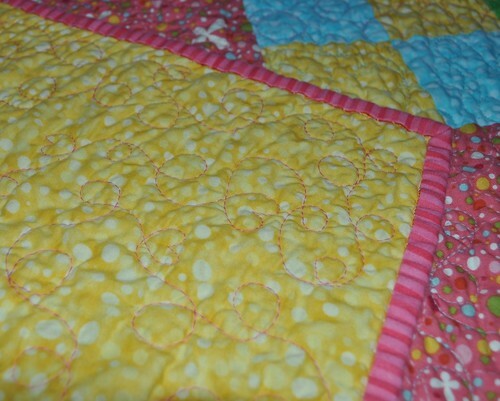 If you look close you can see a couple of the hearts in the quilting stitches. I stitched a heart after about every 4th-5th loop that I quilted. This was fun and pretty easy to make, but even so it still took me a long time to finish. I'd like to make another one, but I have so many other projects going on that I'd like to finish up first. I will definitely commit to making one next year, if I don't get to it sooner.